#bankerafricaawards Investment company,Dyer and Blair Investment Bank was named the 'Best Investment Bank' in Kenya during this years annual Banker Africa Awards 2016. Dyer and Blair,the peoples partner in investment in Kenya as proved recently, battled it out with other super investment giants like KCB Capital,Faida Investment Bank,Cfc Stanbic and African Alliance before crowned the winner. 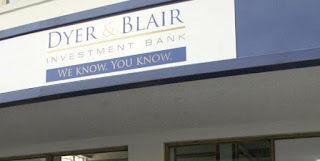 Congratulations to Dyer and Blair Investment Bank for the big win. In the East African category,Barclays Africa Group emerged top 'Best Investment Bank-East Africa' after defeating Standard Chartered Bank,African Alliance,Citi bank and Cfc Stanbic bank.